The NIH recently held its annual 3D Science event in Washington, DC. Speakers ranged from surgeons who 3D print hearts to prepare for surgery to groups that animate macro-molecules within cells. The rate of innovation in scientific visualization is mind blowing! Researchers are now able to turn virtual models into physical objects, aiding in planning complicated, life-saving surgeries or teaching. They’re also able to digitally visualize objects and systems that were never before possible, helping power research discussions and science communication. We were honored to be invited to share EyeWire and announce two new projects. It’s no secret that EyeWire loves design. We see our many images, animations and interactive experiments as stepping stones to sharing more science and getting neuroscience out in the world. Today we’re delighted to announce the launch of our 3D Printable Neuroscience Collection in partnership with the NIH’s 3D Print Exchange. 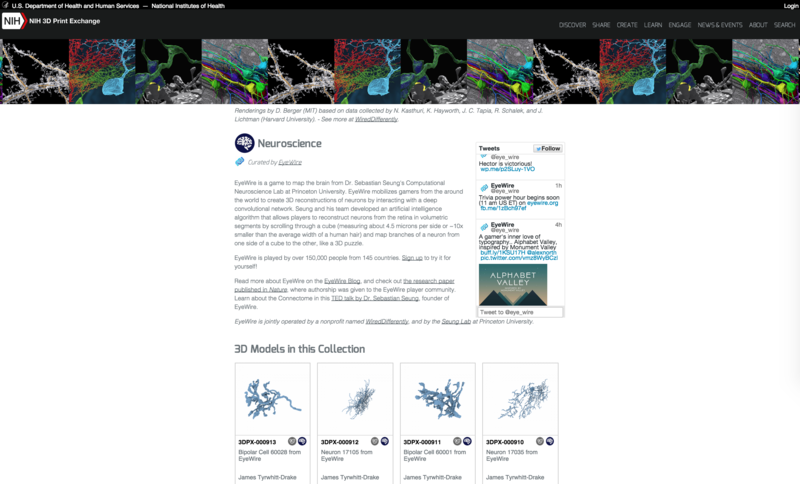 We’ve curated a set of models ranging from individual cells to entire brains – and this is only the beginning. Over the coming months, we’ll collect and create even more files for the collection. Huge shoutout to James Drake and Meghan Coakley from the NIH 3D Print Exchange. This wouldn’t be possible without them. EyeWire uploaded its first neuron back in 2014 and while it was cool in concept, the models wasn’t actually printable. The branches were far too thin and would break without supports. James found our model, improved it, and then did several more cells. We’re working on an automated pipeline so that soon, any cell that’s mapped in EyeWire will be available to 3D print. We’ve teamed up with medical visualization studio Indicated to render a group EyeWire neurons in HD virtual reality. This exhibit debuted at the NIH event — we’re looking forward to releasing it to the public soon.